USS Grenadier (SS-210) After taking severe damage, the vessel was scuttled to prevent capture. The entire crew (76 men) were taken captive, and four of those died in POW camps. The remaining 72 men survived and were repatriated after the war. See the complete crew list for Grenadier's final patrol here. USS Perch (SS-176) After taking severe damage, the vessel was scuttled to prevent capture. The entire crew (59 men) were taken captive, and six of those died in POW camps. The remaining 53 men survived and were repatriated after the war. See the complete crew list for Perch's final patrol here. USS Permit (SS-178) (vessel not lost) One Permit crew member, Herman Joseph Tihen, was transferred ashore for medical treatment, and was later assigned to USS Canopus (AS-9). He was captured with the fall of the Philippines, survived the war in POW camp, and was repatriated after the war. USS Robalo (SS-273) Out of a total crew of 81 men, at least four are believed to have survived the sinking, but were captured and died in captivity. In some accounts, two others (the Commanding Officer Manning Marius Kimmel and one unnamed man) are also said to have survived the sinking but were killed in captivity. See the complete crew list for Robalo's final patrol here. USS S-38 (SS-143) (vessel not lost) One man, Earl Charles Harbin, was transferred to USS Canopus (AS-9) for medical treatment, and was captured with the fall of the Philippines. He died of injuries in Bilibid POW Hospital, Philippine Islands. USS S-44 (SS-155) Two men, Ernest Arthur Duva and William Francis Whitemore, survived the sinking, POW camp, and were repatriated after the war. See the complete crew list for S-44's final patrol here. USS Sculpin (SS-191) 84 men were aboard Sculpin for her final patrol, and 63 men were lost – 12 were killed in action prior to sinking, 30 were killed in the sinking, one man was killed in captivity (not officially a POW) and 20 POWs later died while being transported to Japan in the sinking of Chuyo by sister ship USS Sailfish. One man, George Rocek, was the only Sculpin man to survive the Chuyo sinking, and he was among the 21 Sculpin men who were repatriated from POW camps after the War. See the complete crew list for Sculpin's final patrol here. USS Seadragon (SS-194) (vessel not lost) - One man, Arthur Irving Diaz, who was ashore and captured with the fall of the Philippines, died when Arisan Maru, transporting Allied Prisoners of War from the Philippines to Japan, was sunk by USS Shark (SS-314). Note that Seadragon crew members Walter Amburn Benson and Samuel Howard Hunter, Jr. were killed by a bomb that also hit USS Sealion, moored nearby. USS Sealion (SS-195) Four men were killed in the sinking of the vessel, which was moored at Cavite, Philippine Islands. One Sealion man, Howard Firth, was captured while aboard USS Fisheries II after Sealion was scuttled. He died of dysentery in Cabanatuan Prison Camp #3, Philippine Islands. See the listing of the five lost Sealion men here. Another Sealion man, Herbert Raymond Conser, was also captured, but he survived and was repatriated after the war. USS Tang (SS-306) Sunk by a circular run of her own torpedo. Of the 87 men aboard for her final patrol, only nine were picked up by the Japanese. Richard O’Kane (the Commanding Officer), Floyd Caverly, and William Liebold were swept from the bridge following the initial torpedo explosion. Lawrence Savadkin escaped from the flooded conning tower using free ascent. Although others made the attempt to escape from the sunken submarine from the forward escape trunk using Momsen lungs, the only men who made it to the surface alive and who were later rescued were Jesse Dasilva, Clayton Decker, Henry Flanagan, Pete Narowanski, and Hayes Trukke. 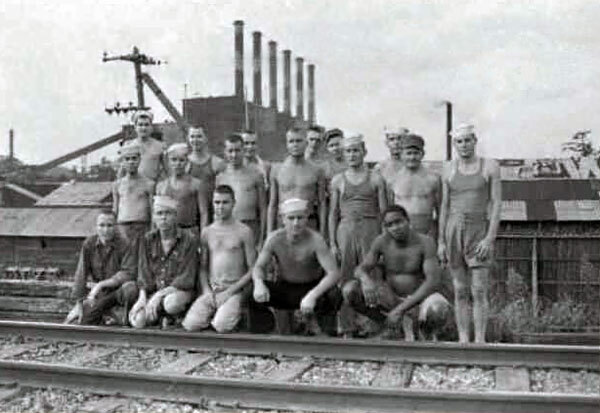 All nine men survived the war in POW camp, and were repatriated after the war. See the complete crew list for Tang's final patrol here. USS Triton (SS-201) On December 1, 1941, one man, Chief Electrician's Mate Harold Ray Thompson, was transferred ashore at Wake Island due to illness. He was subsequently captured, survived the war in POW camp, and was repatriated after the war. Triton was lost on or about March 15, 1943. See the complete crew list for Triton's final patrol here. USS Tullibee (SS-284) Sunk by a circular run of her own torpedo. Out of a total crew of 80 men, one man, Clifford W. Kuykendall, survived the sinking, POW camp, and was repatriated after the war. See the complete crew list for Tullibee's final patrol here. Note that one Tullibee man had died in an accident on a prior patrol. Please note that many men from USS Canopus (AS-9) and USS Pigeon (ASR-6), along with a few men from other submarine tenders and submarine rescue vessels, were captured with the fall of the Philippines. In addition, some submarines carried passengers - such as U.S. Marines and Australian Army personnel - on special missions, some of whom were captured and died in captivity. As of October 1, 2008, the Department of Defense authorized the Purple Heart for POWs (after Dec. 7, 1941) who subsequently died in captivity. At least 234 men with pages on this site (the 37 men listed above plus those from submarine tenders, rescue vessels, and U.S. Marines) died as Prisoners of War. We list the award of the Purple Heart for these men as an indication of their elegilibility for the award, although records in their individual personnel files may not yet reflect the receipt of the award. For an excellent book on Submarine POWs, see Stephen L. Moore's Presumed Lost - The Incredible Ordeal of America's Submarine POWs during the Pacific War, Naval Institute Press, 2009. Research on submariner POWs is ongoing.